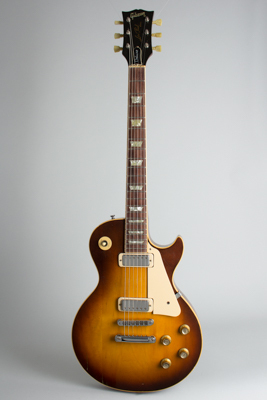 Gibson Les Paul Deluxe Model Solid Body Electric Guitar (1975), made in Kalamazoo, Michigan, serial # 99-123686, sunburst top, dark back and sides finish, mahogany body with maple cap, laminated maple neck with rosewood fingerboard. Overall length is 39 3/8 in. (100 cm. ), 13 in. (33 cm.) wide at lower bout, and 1 7/8 in. (4.8 cm.) in depth, measured at side of rim. Scale length is 24 3/4 in. (629 mm.). Width of nut is 1 11/16 in. (43 mm.). This Deluxe is a well-played veteran of the New Yawk 1970's and '80's, with some scars to prove it but still going strong. There is a decent but not excessive amount of wear overall, including several sets of somewhat inexplicable scratches to various areas the top into but not through the finish. It looks like perhaps someone added some stickers or decals and then later scraped them off. This is not that noticeable except close in-the thicker finish of this period has some advantages! There is a lot of wear to the back, while the sides and back of the neck are not as heavily affected. The guitar is marked as a factory second and is from the first year of issue for the 3-piece maple-neck, with the sticker serial number application Gibson only used for a few years. The guitar has recently been refretted and is a very fine player. All hardware is still original; this one was never routed for a set of "DeeMartzeeios" like many in NY were in the late '70's! The tuners were changed but have been restored back to the original double-ring Gibson-branded Kluson Deluxes with some small marks visible. The only other changed part is a replaced chrome jackplate (the plastic one having broken as it always did). This guitar came in with a very nice lady who told us it had been her grandfather's, and he played it a lot around NYC "Back in the day". It had been without a case for some years and had accumulated a lot of dirt and funk-not the good kind! We've been calling it "Grandpa's Les Paul" and are pleased to have cleaned and restored this well-loved genuine relic to excellent playing condition. Very Good + Condition.